NORTHEAST – The UT Health Science Center has announced the opening of a Community Health & Wellness Center – Jensen to serve the population of Aldine, Jensen, and North Houston. 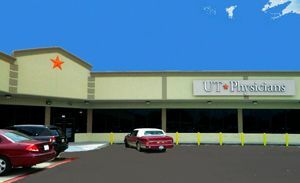 The Clinic is located in the RQ Plaza Shopping Center, at the corner of Crosstimbers and Jensen. It opened in May, and has hours of operation Monday through Friday from 8 am to 5 pm. The public can make an appointment by calling 713-486-8550, or by internet at UTPhysicians.com/chwc-jensen. The Clinic offers primary care for children, adolescents and adults. It brings health care to the surrounding communities. It is an ambulatory, primary care setting with a focus on community health and wellness. It also has a dedicated space for wellness education programs. On-site manager of the facility is Marlon Stewart. The Clinic offers family medicine, internal medicine, and pediatrics. It will soon also offer Adult and Pediatric Counseling and Psychiatry. Pastor David Smith of the Northeast Economic Development Corporation welcomed the clinic, and said that it was a sign of the revitalization that is planned for the Jensen corridor, once a thriving business street. Smith said that other new projects will be soon occupying the vacant storerooms and properties on the street. The UT Physicians Community Health & Wellness Center-Jensen is staffed by the clinical practice of the McGovern Medical School, part of the University of Texas. Patients of the Clinic will have access to over a 1000 physicians certified inn 80 medical specialties, according to Stewart. UT Physicians accepts most insurance plans, including Medicare, Medicaid, and CHIP. Financial assistance programs are available for those who need them. For appointments, call 713-486-8550.